Hayley plays JV volleyball on her school team, and we're at the end of the season. The team started off a little shaky, but they worked hard, pulled together and made it to the playoffs! Yesterday was the first playoff game against Linfield Christian, and we WON!!! It was an awesome, nail-biting game. Seriously, my heart can barely handle it. Our next game is on Wednesday. Can't wait! I have to take a moment to brag about how awesome our girls are. The Cougars have always been sort of the underdogs. They're playing against schools that have state of the art gyms, and year-round practice. We don't have a home gym, so our girls have had to practice in 90 degree weather on blacktop, and even had to cancel a few practices because of the heat. They practice seasonally, not all year long. But there is something our girls have that I've noticed most other teams lacking, and that is awesome team spirit! Good volleys, bad volleys, great serves, not so great serves - every play, good or bad, the girls would high five, cheer and encourage each other. They didn't make each other feel bad for missing a serve or not getting the ball over the net. They had the best sportsmanship out of all the teams out there, and it made all us parents proud. They also have two fantastic coaches, Ed and Lyn, whose dedication and words of encouragement helped take these girls from the underdogs, to the team to beat! I'm so proud of the team, and proud of Hayley. I took some shots of the game but the lighting was too low for any quality pics. Here are a few shots of my girl! I can't believe our baby boy is six years old! Austin is growing up so fast, and growing out of things faster than we can keep up. He is so fun to be around and have a conversation with. He is our family clown and keeps us laughing with his funny perspective of the world around him! Austin has been counting down toward his birthday for two weeks, and today was finally the day! He was very excited about his birthday, so much so that he reminded me of it over and over, starting at 6:30 this morning. We had a special day planned, starting with a trip to every child's mecca, Toys R Us. Austin took his time in carefully picking out two toys on his wish list, and then we went home to hang out for a while until dad got off of work. When we got home, there was a package waiting for him on the doorstep from Pop & Grandma Lorraine. He was SO excited to have mail with his name on it! He opened it and was happy to find two books on BUGS! There was also a package from Grandma Myrtle. She sent each of the kids an electronic money bank that they were in awe of when we visited her this past summer. Of course, now they want money to fill them up with, and immediately came to me for their first deposits! Later in the afternoon, we were off to his favorite place in the world to eat, Souplantation. He was happy to get a special birthday treat of a bag of chocolate chip cookies. Chris and I were a little disappointed to learn that now he's six, he bumps up to the next pricing level on the menu. Darn! 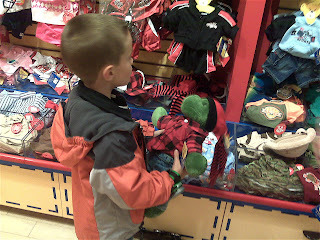 After filling up on salad, pasta and blueberry muffins, we headed over to Build-a-Bear, where Austin outfitted his favorite turtle, Optimus Prime, with new warm winter clothes. He also scored a new box to keep him in, which he was really stoked about. After Build-a-Bear, we headed over to Nana and Papa's for some yummy birthday cake. Austin was tired after the long and busy day (and so were were we!) so he spent the night at Nana and Papa's. Tomorrow, they are taking him for his second round of birthday shopping! All in all, he had a great day, but he was a little disappointed that there would be no birthday tomorrow. Let the new countdown begin! This past weekend, the Vista FD families got together for a little campin' in the dirt. A big circle of trailers, ATV's, a roaring bonfire and some great food were enjoyed by all! Hayley graduated from her 90 quad to the 400, and the boys took turns on the 90, each doing really well (naturally, Matt was the bravest daredevil). Of course, now they each want their own for their birthdays. Not gonna happen, though it was fun to hear all the things they promised if we gave in! Wherever we go, if there is a bbq grill, Chris will somehow find himself behind it. This trip was no different. Despite the fact that there were at least a dozen other guys hanging around, it took no time at all before there he was, bbq tongs, headlamp and obligatory beer in hand, grilling the sausages and peppers! The highlight (or should I say lowlight) of the trip was that some gusty winds rolled in early Sunday morning, and by dawn we were in the middle of a gnarly wind/dirt storm. The wind was so strong and the dirt blown around was so thick that it literally hurt to go outside. We managed to eat a nice breakfast (thanks to Chris) and then headed outside to quickly load up and get out of there. It was probably the quickest we have ever packed up the trailer! When we got home, it took several hours to get all the dirt and sand out of the trailer, the quads, the gear, and our hair. The pelting rocks ruined a side view mirror on the truck we borrowed from our neighbor, so we have to replace that. Needless to say, it was a LOT of work for ONE day of fun in the desert. I told Chris that in the future, we should just stick to Glamis. At least the sand doesn't hurt and it isn't as messy! Welcome to our imperfectly perfect family! I started this blog about a year ago, and I'm just now getting around to actually doing something with it. So goes it in the Bowden house. I don't think anyone does procrastination better than we do! I suppose I should start off by explaining the blog title. Well, you know how there is always "THAT" family? The one with the kids who play outside with no shoes (or for extra points, no shirts either). The one with the frazzled mom whose frequent shouts for peace and quiet can be heard three doors down. The one that occasionally lets their children eat cereal for dinner and M&M's on their pizza. The one with the friendly yet overly-hyper dog that jumps up and excitedly pees on anyone who comes to the door. The one with a rusty bike on the lawn and two mismatched flipflops in the driveway. The one with dishes always in the sink, toys all over the floor and somewhere in the house, a toilet that didn't get flushed. Life with three busy kids and an even busier husband is incredibly fun, but definitley not a walk in the park! Don't get me wrong - we are very thankful to have been blessed with our children and each other, and we wouldn't trade our lives, trials and all, for anything else in the world. There are days though where it can be physically and mentally exhausting and we question whose idea it was to have all these kids in the first place. I'm convinced that similar families of our size who have spotless houses, perfectly groomed and behaved children, balanced daily schedules and a healthy dinner on the table every evening by six have superpowers. Or they are aliens another planet. Not us! As envious as I am of the super-families of the world, we proudly wear our imperfections on our sleeves, because being normal would be boring. And besides, what is normal anyway? As imperfect as our family is, we truly love each other in our own unique and special ways. Hayley shows her love for her brothers by occasionally letting them sleep with her at night, playing "school" with them, complete with referrals to the "principal" (me) when they don't listen, and by getting them to play dress up in her old sequined dance tutus. I'll have to dig those pictures out sometime! The boys show their love for their sister by asking her to read to them at night, and by affectionately drawing pictures of her with goofy monster teeth, twenty fingers and an eyeball where her nose should be. Pure sibling love. Chris and I, well....we have a special love and affection for each other that is all our own. We fell in love eleven years ago, and just recently celebrated our ninth anniversary! We both have a weird sense of humor and make each other laugh over the silliest of things. We love to affectionately debate each other, and we can have a conversation without saying a word. I knew I had to marry him when, right after the funeral for my father, he tried to cheer me up by doing a strip tease to Disney's "Bear Necessities" song. Seriously, if a guy loves you enough to go to such lengths to put a smile on your face, you have to marry him. He may reconsider how much he loves me though once he finds out that I posted that tidbit to our family blog! Oy. Anyhow, I'm really bad at making regular phone calls, so my hope is that this blog will help us stay connected to friends and family, and keep everyone up to date on the latest shenanigans in the Bowden house. While we hope to entertain you with our delightful family tales and humorous adventures, I'm sure our posts won't always be rainbows and unicorns. We might have a really lousy day, and for some reason I may feel compelled to share it with you all. But that's what you'll get from this blog - the funny stuff, the not so wonderful, and everything in between! Chris and I will probably take turns at posting, and I'm sure Hayley will share her point of view now and then. 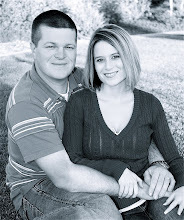 I'll also be blinging the blog up a bit as I go, and adding some pictures and some fun bios of each family member. Stay tuned, and I'll try my best to post as often as I can!